While we may not identify it, most of us are living privileged lives. It’s not based on money or property but rather our physical abilities. Most of us come across people who have all their mental abilities and physical parts intact, therefore, making them a ‘whole’ human. And since we come across this ‘whole’ human so many times, we have taken them for granted. But it doesn’t take a lot of searching to find out people who do not fit the ‘whole’ human category. There are people who are blind, physically challenged, suffering from some kind of incurable debilitating disease, or are mentally challenged. Sinikwe Kademaunga, a girl from Harare, Zimbabwe, is such a person. She does not belong to the ‘whole’ category. But she is so much more. 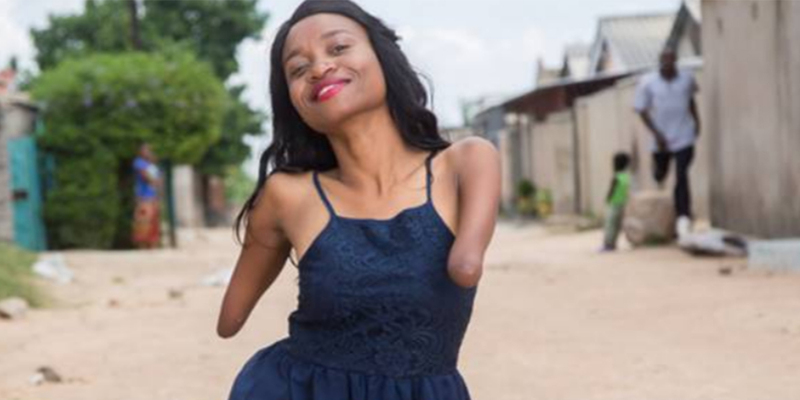 Sinikwe Kademaunga was born without any hands. Nobody knew what her condition really was. She did not have knees too. So, even though she was growing up, she did not grow tall but remained short. It almost seemed like she was cursed. Her family had a difficult time with her – not because of her stature but because they wondered if she would ever be accepted by the society they lived in. She got the constant glare of humor and pity – it made her sad for herself. But her grandmother was a kind woman. She was not willing to see her granddaughter fall in the pit of self-doubts like many men and women generally do. So, she made it a point to make her house completely accessible for Sinikwe Kademaunga. She could write, eat, and was free to do all kinds of tasks. Strangely enough, she took a liking to makeup too, and started doing her own makeup. She was turning out to be beautiful. She even made her own wig. Yes – Sinikwe Kademaunga is not someone who will be put down just because she has not been gifted to be ‘whole’ by Nature. She has accepted herself and she knows that she is beautiful. Sinikwe has somehow come to the realization early on that society has some set standard of beauty or normalness. She realized that she did not belong to that standard. But that was ok. She was someone who was out of that circle and from there, she could rise. And she chose to do so. Sinikwe disregarded the glares, the taunts, the discouragement, and went over to the internet and shared the story of her life. She maintains her own blog. Sinikwe has around 3000 followers. She is an inspiration and many people are slowly accepting themselves as they walk the path shown to them by this wonderful woman. In 2016, Sinikwe received the Zimbabwe International Women Award. She has also spearheaded many motivational events. She recalls one of her best times when she was approached by a woman during a motivational event and hugged by her. The lady was hopeful about her own life because of Sinikwe. It made her realize the impact that her work had on everyone. She knows she has to continue her work of inspiring people. She has to contribute her little part to change the world. Her advice for everyone is to always have a positive attitude towards life. One should love oneself first before expecting anyone else to even look at them that way. Once you accept who you are, all the limitations take a backseat. Sinikwe Kademaunga may have been born different, but it is her difference that makes her such an important part in everyone’s life. So, accept yourself if you are different – and change the world.
? Australian Government Plans To Ban All Animal Testing For Cosmetics In 2020 ‘People Will Wonder Why We Didn’t Do This Sooner’: New York Becomes Second State To Ban Plastic Bags ?